Trees hold us fast in their embrace. 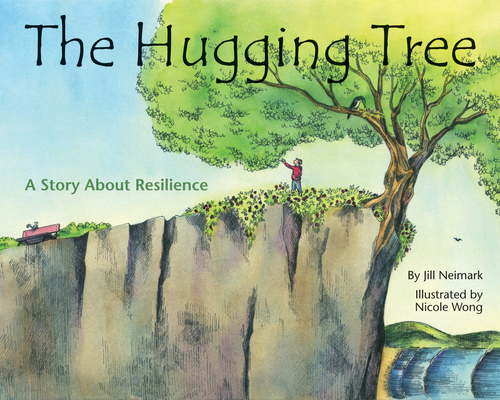 The Hugging Tree is about a tree that, in spite of harsh circumstances, grows until it can hold and shelter others. It is about each one of us. Childhood often is a wondrous and carefree time, free from the stresses and responsibilities of adulthood. However from time to time, children must deal with difficulties from minor disappointments like losing game or earning a poor grade, to significant emotional upset stemming from traumatic experiences such as the death of a parent, abuse, or neglect. The Hugging Tree follows tells the story of a little tree growing all alone on a cliff, by a vast and mighty sea. Through thundering storms, and the cold of winter, the tree holds fast. Sustained by the natural world and the kindness and compassion of one little boy, eventually the tree grows until it can hold and shelter others. The resilience of the Hugging Tree calls to mind the potential in all of us: to thrive, despite times of struggle and difficulty. To nurture the little spark of hope and resolve. To dream and to grow, just where we are. Psychologists use the term resilience to describe an individual's ability to adapt successfully to challenging events. Reading this book with your child can be a way to teach resiliency, self-confidence, and self-control and help you discuss common challenges your child may be facing at home or at school. A "Note to Parents" by Elizabeth McCallum, PhD., which provides more information about resilience, and guidelines for building resilience in children. Jill Neimark is an author of fiction and nonfiction, an award-winning science journalist and essayist, and former features editor at Psychology Today magazine. Her credits include the middle-grade novels The Secret Spiraland The Golden Rectangle, the adult novel Bloodsong, and the adult nonfiction title Why Good Things Happen to Good People: How to Live a Longer, Healthier, Happier Life by the Simple Act of Giving. Her picture books include I Want Your Moo and Toodles & Teeny: A Story of Friendship. She lives in Georgia. Visit her at www.jillneimark.com and follow her on Facebook and Twitter: @JillNeimark. Nicole Wong is a graduate of the Rhode Island School of Design. Her illustrations have been featured in several children's books, including No Monkeys, No Chocolate and Ferry Tail. Nicole lives with her husband, daughter, and their dogs and cat in Massachusetts. Visit her at www.nicole-wong.com and follow her on Facebook: @painternik and Instagram: @painternik9.